The 100% Waterproof Elite Premiun Truck Cover. The Elite Premium 3 Layer 100% WATERPROOF Pick Up Truck Cover is ideal for high moisture climates including all across the US and Canada. THREE Layer SFS Rain Shield protects your vehicle from harsh elements like rain, snow, tree sap, bird droppings, and other dirt. Ultrasonic welding seals seams tight and prevents water penetration. Completely breathable and treated for U.V. stability regarding sun and heat protection. The reinforced side grommets help to keep your cover locked down with a Cable Lock or bungee cord. Elasticized front and back hems add for a snug fit. The Elite Supreme Three Layer 100% Waterproof Pick Up Truck Cover is light weight and easy to handle. Each cover comes with a FREE Storage Bag included. Available in Tan. Some sizes are avaiable in Grey. INCREDIBLE 2 YEAR WARRANTY! This Elite 100% Waterproof Mini Pick Up Truck Cover has an dependable 2 Year Warranty and is safe to use in all types of weather conditions. From extremely wet areas like the North West to 4 season climates like New York, this cover is the all around BEST! Waterproofing is achieved through welding the seams ultrasonically. There is no stitching used and this ensures that no water will seep through the seams. IIn addition, the hem is elasticized in the front and rear of the cover to ensure an extra snug fit. The reinforced side grommets help to keep your cover locked down with a Cable Lock or bungee cord. Cover dimensions are 15' L x 65" W x 58" H and is great for Mini Pick Up Trucks before 1980 with a Regular Cab and a Regular Bed. Available in Grey or Tan. INCREDIBLE 2 YEAR WARRANTY! Suggested Retail Price $124.99. This Elite 100% Waterproof Mini Pick Up Truck Cover is safe to use in all types of weather conditions. From extremely wet areas like the North West to 4 season climates like New York, this cover is the all around BEST! Waterproofing is achieved through welding the seams ultrasonically. There is no stitching used and this ensures that no water will seep through the seams. IIn addition, the hem is elasticized in the front and rear of the cover to ensure an extra snug fit. The reinforced side grommets help to keep your cover locked down with a Cable Lock or bungee cord. Cover dimensions are 16' L x 65"W x 58" H and is for a Mini Pick Up Truck with a Regular Cab with a Regular Bed. Available in Grey or Tan. INCREDIBLE 2 YEAR WARRANTY! Suggested Retail Price $124.99. This Elite 100% Waterproof Mini Pick Up Truck Cover is safe to use in all types of weather conditions. From extremely wet areas like the North West to 4 season climates like New York, this cover is the all around BEST! Waterproofing is achieved through welding the seams ultrasonically. There is no stitching used and this ensures that no water will seep through the seams. In addition, the hem is elasticized in the front and rear of the cover to ensure an extra snug fit. The reinforced side grommets help to keep your cover locked down with a Cable Lock or bungee cord. Cover dimensions are 17'6" L x 65" W x 58" H and is for a Mini to Mid Size Pick Up Truck with a Regular Cab and a Regular Bed. Available in Grey or Tan. INCREDIBLE 2 YEAR WARRANTY! Suggested Retail Price $124.99. This Elite 100% Waterproof Mini Pick Up Truck Cover has an realistic 2 Year Warranty and is safe to use in all types of weather conditions. From extremely wet areas like the North West to 4 season climates like New York, this cover is the all around BEST! Waterproofing is achieved through welding the seams ultrasonically. There is no stitching used and this ensures that no water will seep through the seams. In addition, the hem is elasticized in the front and rear of the cover to ensure an extra snug fit. The reinforced side grommets help to keep your cover locked down with a Cable Lock or bungee cord. Cover dimensions are 17.5' L x 65" W x 58 H and is for a Mini to Mid Size Pick Up Truck with an Extended Cab and a Regular Bed. Available Grey or Tan. INCREDIBLE 2 YEAR WARRANTY! Suggested Retail Price $124.99. This Elite 100% Waterproof Mini Pick Up Truck Cover has an realistic 2 Year Warranty and is safe to use in all types of weather conditions. From extremely wet areas like the North West to 4 season climates like New York, this cover is the all around BEST! Waterproofing is achieved through welding the seams ultrasonically. There is no stitching used and this ensures that no water will seep through the seams. In addition, the hem is elasticized in the front and rear of the cover to ensure an extra snug fit. The reinforced side grommets help to keep your cover locked down with a Cable Lock or bungee cord. Cover dimensions are 17.6' L x 65"W x58" H and is for a Mid Size Pick Up Truck Cover with an Crew Cab or Extended Cab and Regular Bed. Available in Grey or Tan. INCREDIBLE 2 YEAR WARRANTY! Suggested Retail Price $124.99. This Elite 100% Waterproof Mid Size Pick Up Truck Cover for CREW CAB and EXTRA SHORT BED. It is safe to use in all types of weather conditions. From extremely wet areas like the North West to 4 season climates like New York, this cover is the all around BEST! Waterproofing is achieved through welding the seams ultrasonically. There is no stitching used and this ensures that no water will seep through the seams. In addition, the hem is elasticized in the front and rear of the cover to ensure an extra snug fit. The reinforced side grommets help to keep your cover locked down with a Cable Lock or bungee cord. Cover dimensions are 17'6" L x 65" W x58" H and is for a Mid Size Pick Up Truck with a Crew Cab and an Extra Short Bed. Works great on a Honda Ridgeline or Ford Explorer Sport Trac. Available in Grey or Tan. INCREDIBLE 2 YEAR WARRANTY! Suggested Retail Price $124.99. This Elite 100% Waterproof Mini Pick Up Truck Cover is safe to use in all types of weather conditions. From extremely wet areas like the North West to 4 season climates like New York, this cover is the all around BEST! Waterproofing is achieved through welding the seams ultrasonically. There is no stitching used and this ensures that no water will seep through the seams. In addition, the hem is elasticized in the front and rear of the cover to ensure an extra snug fit. The reinforced side grommets help to keep your cover locked down with a Cable Lock or bungee cord. Cover dimensions are 18.6' L x 65" W x58" H and is for a Mid Size Pick Up Truck with a Crew Cab and a Regular Bed. Available in Grey or Tan. INCREDIBLE 2 YEAR WARRANTY! Suggested Retail Price $124.99. This Elite 100% Waterproof Mini Pick Up Truck Cover is safe to use in all types of weather conditions. From extremely wet areas like the North West to 4 season climates like New York, this cover is the all around BEST! Waterproofing is achieved through welding the seams ultrasonically. There is no stitching used and this ensures that no water will seep through the seams. In addition, the hem is elasticized in the front and rear of the cover to ensure an extra snug fit. The reinforced side grommets help to keep your cover locked down with a Cable Lock or bungee cord. Cover dimensions are 18.6' L x 65" W x 58" H and is for a Mid Size Pick Up Truck with a Crew Cab and a Short Bed. Available in Grey or Tan. INCREDIBLE 2 YEAR WARRANTY! Suggested Retail Price $124.99. 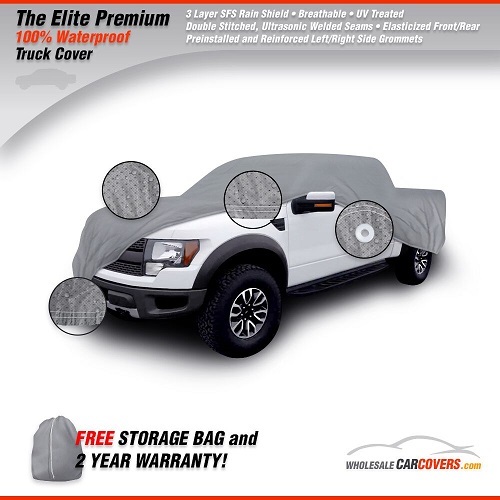 This Elite Premium Waterproof Full Size Pick Up Truck Cover is safe to use in all types of weather conditions. From extremely wet areas like the North West to 4 season climates like New York, this cover is the all around BEST! Waterproofing is achieved through welding the seams ultrasonically. There is no stitching used and this ensures that no water will seep through the seams. In addition, the hem is elasticized in the front and rear of the cover to ensure an extra snug fit.The reinforced side grommets help to keep your cover locked down with a Cable Lock or bungee cord. Cover Dimensions are 19.5" L x 75"W x 64" H and is for a Full Size Pick Up Truck w/ an Extended Cab and a Short Bed. Available in Grey Only. INCREDIBLE 2 YEAR WARRANTY! Suggested Retail Price $149.99. This Elite Premium Waterproof Full Size Pick Up Truck Cover is safe to use in all types of weather conditions. From extremely wet areas like the North West to 4 season climates like New York, this cover is the all around BEST! Waterproofing is achieved through welding the seams ultrasonically. There is no stitching used and this ensures that no water will seep through the seams. In addition, the hem is elasticized in the front and rear of the cover to ensure an extra snug fit.There are also reinforced grommets on both sides of the cover that can be used with the cable lock for added protection from both theft and high winds. Cover dimensions are 21' L x 75"W x 64" H and is for a Full Size Pick Up Truck with an Extended Cab and a Long Bed. Available in Grey or Tan. INCREDIBLE 2 YEAR WARRANTY! Suggested Retail Price $149.99. This Elite Premium Waterproof Full Size Pick Up Truck Cover is safe to use in all types of weather conditions. From extremely wet areas like the North West to 4 season climates like New York, this cover is the all around BEST! Waterproofing is achieved through welding the seams ultrasonically. There is no stitching used and this ensures that no water will seep through the seams. In addition, the hem is elasticized in the front and rear of the cover to ensure an extra snug fit. The reinforced side grommets help to keep your cover locked down with a Cable Lock or bungee cord. Cover dimensions are 21'L x 75" W x 64" H and is for a Full Size Pick Up Truck w/ a Crew Cab and a Short Bed. Available in Grey Only. INCREDIBLE 2 YEAR WARRANTY! Suggested Retail Price $149.99.